The Prelux Saturn Pure IP66 LED Highbay with SMD LEDs, Meanwell driver and PC lens is designed for use in food production facilities. 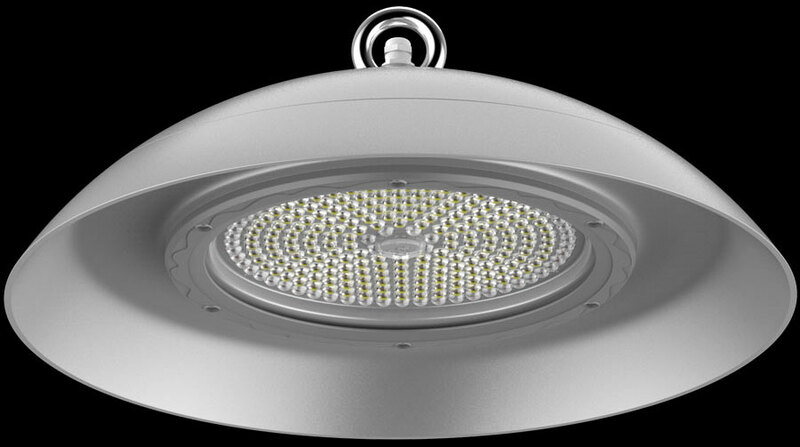 The Prelux Saturn Pure provides a new level of innovation in energy saving, food safe, maintenance free high bay lighting by discarding the standard COB design and opting instead for a smarter, more efficient SMD design which provides a smaller, lighter and more powerful solution. The smooth body of the Pure makes it highly efficient at preventing the accumulation of dirt and dust, while the seamless exterior design makes it extremely easy to clean. With an IP66 ingress protection rating the Pure is also waterproof, making ideal for the type of essential deep cleaning required by the food processing industry. Saturn Pure contains no visible screws while the normal glass lens is replaced by the safer and more efficient polycarbonate lens which increases luminous efficiency up to 130lm/W. The Prelux Saturn LED’s inherent reliability is ensured by rigorous production line inspection and testing, and thorough burn-in procedures. Prelux LED are so confident in the design, internal parts and build quality of the Saturn Pure that the fitting comes with a five year warranty.